Where do you influence the ball? Base your pick and roll defence on that. They keep the ball out of the middle of the floor (no-middle). X2 has a no-middle stance, nose on 2's inside shoulder, his numbers have to see 2's numbers (he is not parallel to the sideline). Be physical on the ball, he has to be able to trace the ball without losing balance. Swarm the ball any time it is picked up, body to body, try to push him out of bounds, make them call a foul. His first step is in the direction the ball goes. If 2 drives middle, never drop the inside foot, he should be able to step right up with it. You are a show team or a drop team. Two people on the ball above the screen is becoming more difficult. A drop team protects the basket, keeps the ball and the roller in front of them. The most common mistake is over-helping, leaving guys open for 3s. 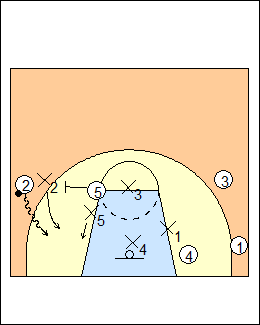 They are an ice team on side pick and rolls (down, blue), and a weak, drop-and-under team in the middle of the floor, going under a majority of middle ballscreens (3 out of 4). 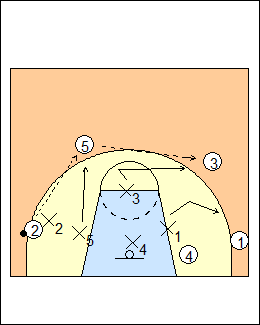 This keeps them out of rotations, the big is in good position to corral the ball, no free rolls to the basket. The dribble 3 is not high percentage. Any time you can get a contested two-point shot that is not in the restricted area, you have won the possession. He believes in simplicity. You should be able to guard all ballscreens 2 on 2 (he doesn't like X-ing out the bigs). The big must communicate the coverage to the guard. Pursuit is everything, the guard is never out of the play, active hands. No direct pass out of a ballscreen, can't throw a strike. He also believes in switching groups, players that all switch together (e.g. 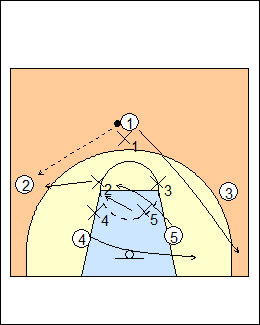 players a-b-c), that keeps them out of rotations. See Defending - Woodley 2 on 2 ballscreens, Utah Jazz hands drill. also Woodley 1 on 1 from ballscreen. 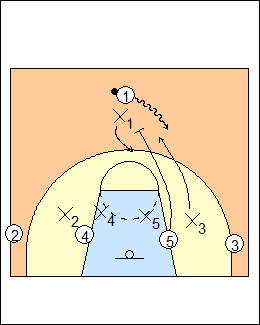 3-out 2-in set, X2 and X3 are on the elbows, 1 is usually a good ballhandler. 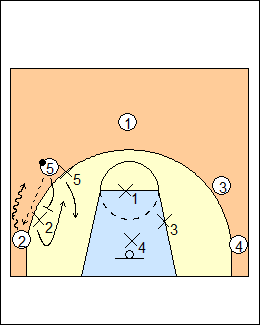 1 passes to 2 and cuts to the weakside corner, 4 goes under to the weakside short corner (the dunker spot), 5 runs to ballscreen. When 5 ballscreens, from nose-on-shoulder X2 puts an arm bar on 2 and takes one step with his top foot (higher), but doesn't jump, he drives the ball down but no direct line to the basket. X5 yells "ice" and drops to the first marker above the high-school block, his drop coverage. Always have a guy at the nail (X3) and at the low spot, who calls "low". With two attackers low weakside, they want the bigger defender (here X4) to be the low man for better rim protection and getting out to a three-point shooter. X1 is a center-fielder who covers the best shooter. X1 and X3 have to talk, X1 might take a first pass to 3. Once X5 calls "ice", all bets are off, off-ball defenders are in their spots, they are not moving until the ball is played out of the pick and roll. 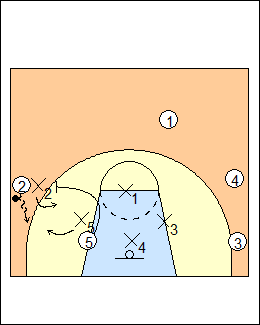 If weakside 3 cuts to the rim (slash, 45 cut), X3 passes him off to the low defender. If 2 tries to snake dribble back to the middle, X2 has to pursue the ball, X1-X4-X3 clear and don't allow a pass for a wide-open 3. X5 can't allow a baseline dribble-around. If 2 dribbles under the rim (a Gretzky), X5 takes him, X2 takes the big. If 2 is able to use the screen and drive middle, X2 must spin under so 5 has to roll through him, he can't fight over (see Woodley 2 on 2 ballscreens). 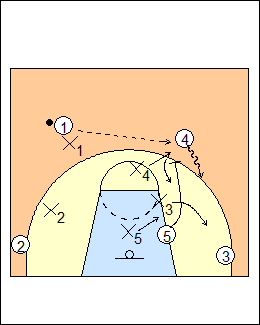 If 5 pops and is a shooter, nail player X3 stunts at him on a pass, buying time for X5 to close out. If 5 passes to 3, X1 has to stunt and buy time for X3 to recover, then X1 denies the corner with his "stick" hand (and does not help off the corner). Any time 4 or 5 catches the ball up top ("big up"), deny a wing pass, if he passes and runs to ballscreen, those are really hard to ice. Force a wing catch out as high as possible (active hands, deflect the ball), allowing the big to get into coverage (see Woodley 2 on 2 ballscreens). 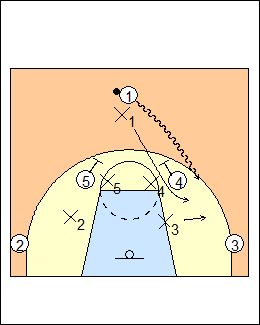 See Defences - Dave Severns ballscreens, Procopio ballscreens. X1 is guarding the ball with his nose on 1's right shoulder, forcing him left, because that is going to be their weak coverage no matter which way 5 comes up to screen. Most teams try to have 5 roll where there is one defender (here X2), and shake out of the corner (2 lifts), putting X2 in a bind. X1 wants to go under as much as he can, the only way to do that is to pressure the ball out top. If he plays off the ball, a good team will bring him down where it's an easier 3 if he goes under. Once X1 hears X5 yell "weak" he gets into the ball and forces left. It is harder to pass left-handed. X5's rules are the same as a sidescreen, he has low hands, matching 1's numbers. The ideal drop spot for X5 is about one foot above the no-charge semi-circle, if he moves up close to the ball it gives 1 a better chance to dribble around or split, and roller 5 can get behind him. If 5 doesn't roll, X5 can get right back out to him. X5 can maybe move up if defending a guy that constantly picks and pops. X4 and X3 are in denial positions (100 stance), the ball is being dribbled at them. X2 physically tags the roller from weakside, in the line of 2 (never run up to tag). Against a good player, mix it up, sometimes go over, sometimes go under. If the screener re-screens, go under again, the big defender stays on the ballhandler's numbers. Money (switch) - switch to touch, X1 goes under the screener, see below. 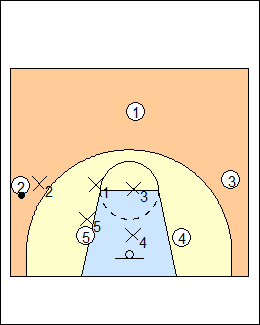 See Defences - Van Gundy ballscreens, Defending - Messina ballscreens. 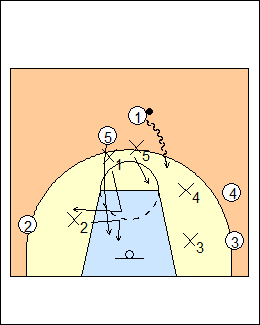 1 passes to 4, 5 sprints into a step-up ballscreen. 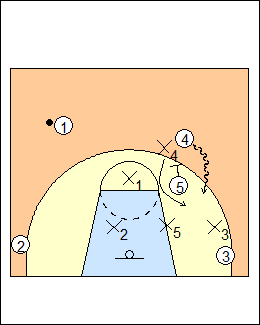 This is an ice, but treat this like a middle pick and roll, go under 3 out of 4 times. Woodley calls it an ice because if X4 gets right into 4's body, forcing him to the corner, he doesn't think that 5 can even screen X4. Ettore Messina - force the ballhandler down. 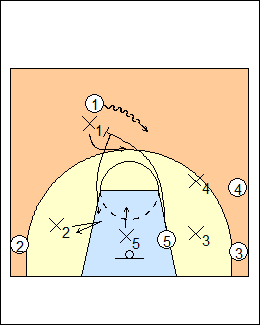 If 5 sets the screen, X5 protects the paint; if 4 (a shooter) sets the screen, X4 switches with X1 (who goes over the screen). Herb Brown - X1 fights over a step-up screen, or switch similar size. Kevin O'Neill - blitz a step-up ballscreen. See Defence - Kevin O'Neill ballscreens. X4 spins under if he gets hit by the screen, taking away a snake dribble to the middle (pursuit, get back in the play). Nail defender X1 stunts if 5 picks, pops and gets a pass. See Defending - Utah Jazz hands drill. X2 is denying the corner, but if the ball does go there he has a no-middle stance. If 5 follows to ballscreen and can really shoot, the defence can't ice it because it's too far for X1 to go if 5 pops to the wing. Instead, go under the screen, treat it like a dribble hand-off, X2 has to force 2 into the screen, and can slide or spin under the screen. X5 still matches 2's numbers (chest to chest). See Defending - Woodley 2 on 2 ballscreens. 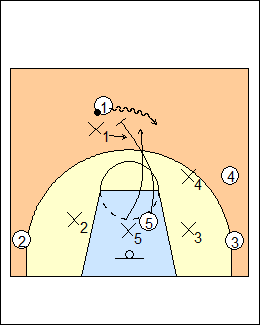 X4 yells "four, four, four", X1 forces 1 to the 4-man side, and always goes under the screen (slide it), the coach didn't draw it up for 1 to take a 3-point shot off the dribble. X5 can stay connected to 5 and not get buried in front of the rim. 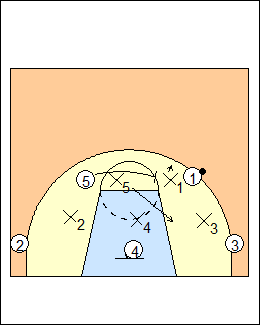 Horns Twist - if 4 rolls then 5 ballscreens, ice the second screen, keep it over on that side, X5 drops. Another option against Horns is to get the ball out of the point guard's hands so they can't get into the action, trap with the best on-ball post defender (before the play), then just retreat. As 5 runs up to ballscreen, corner defender X3 switches to him, then switches to 1 coming off the screen (switch to touch). X5 takes 3, and is closer to the basket for rebounding. Switch late in the shot clock (under 7 seconds), or if it's late game and a guy has been hurting them. "Alert" - if a guy has really been hurting then, go over the screen and trap, with full rotation. As 5 rolls, X2 takes him and X1 swaps. X1 can't get kicked out until X2 pushes him out, 5 will slip to the rim. If 5 sets the screen on the other angle so 5 is rolling towards X4 and X3, the biggest guy takes him. Money in ice. They are a no-middle team, X2 doesn't do anything different, drives down 2 even though they are in money, gets inside position on 5. X5 can move up into the switch, and doesn't let 2 come to the middle. Against a spread pick and roll, they want X4 to be the low man if he can (shown).